I needed to bend some wood the other day. I was installing new gunwhales and inwales on a fiberglass skiff (an old “Plastic Pete’s”) that was molded with a rounded bow as many of those fiberglass skiffs are. The original wood had rotted away after one of those nice canvas covered town rub rails had been installed, collected water and never dried out. I was loath to build a real steam box just for the time it would have taken so I came up with this quick steam box, and it only took a few minutes and cost only about $10. 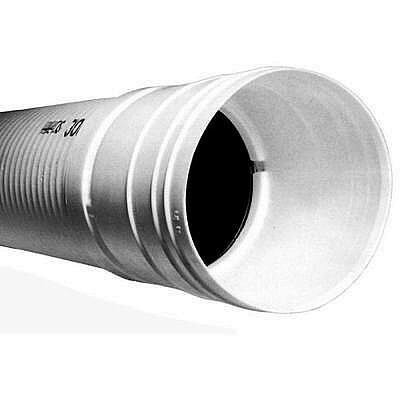 Buy a 10′ section of 4″ diameter Schedule 20 PVC pipe at your building supply yard. 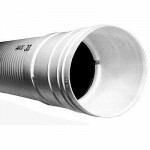 This pipe is used for foundation perimeter drains in the building industry. The pipe I got is distributed by Genova, is made by ADS, and is labeled “3000 lb Triple Wall”. The wall construction of this pipe is corrugated just like a cardboard box but is made from PVC (polyvinyl chloride). It will easily withstand the temperature of boiling water and steam at ambient pressure. Not only is it light but it has the great advantage of having a high insulating value. This is desirable because the steam will not condense as readily on the walls of the pipe and lose its effectiveness at steaming the wood. Avoid buying Schedule 20 or 40 PVC pipe with a solid wall as it will not give you as effective an insulating effect. Buy a couple of end caps that fit over the ends of the pipe to close it off. The pipe that I purchased had a coupling molded onto one end that took a special cap on that end. As a cautionary note, you should never burn PVC because it gives off toxic gasses when ignited. Now all that is needed is a boiling vessel, a piece of old garden hose (or suitable substitute) and a camp stove. The boiling vessel can be anything that will hold and boil a couple of gallons of water. I used an old five gallon galvanized can that I found at the junk yard that might have been used for kerosene or other solvent. An old metal gas can will work, but be sure to rinse out all the gasoline before putting it over a fire! A large sauce pan or Dutch oven would work as well. If you have none of these you can buy a cheap aluminum pot with cover for only a few bucks. Drill a hole in the cover that is slightly smaller than the garden hose outside diameter so that the hose can be stuffed into it and seal itself in the hole. Drill the same diameter hole in one of the end caps near the edge of the cap so that the condensate will not form a puddle in the pipe and will run back into the boiling vessel. The cap should fit tightly over the PVC pipe. If a tight fit cannot be had, use duct tape to seal it. Tie the PVC pipe on a stiffening board and put it on some saw horses or anything to elevate it higher than the boiling pot with the far end of the pipe slightly higher than the inlet end so that the condensate will run back toward the supply hose and drain back into the boiling vessel. 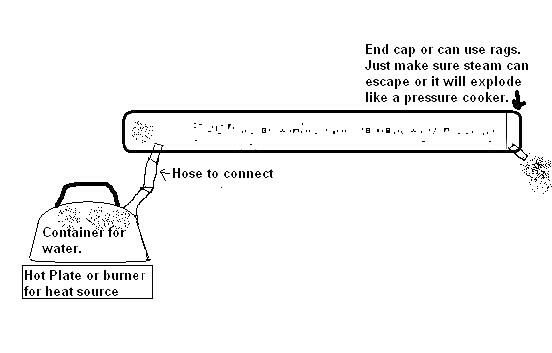 Install the hose from the boiling vessel into the PVC pipe end cap (make it only long enough to go from the boiling pot to the steaming pipe and no longer), put a couple gallons of water in the pot, and put the pot on your camp stove. In the opposite end of the PVC pipe put in the wood to be steamed and then install the end cap. If that cap is tight fitting, drill a couple of small holes in it (1/4 inch) so that the steam will migrate down to the far end of the pipe and vent out. 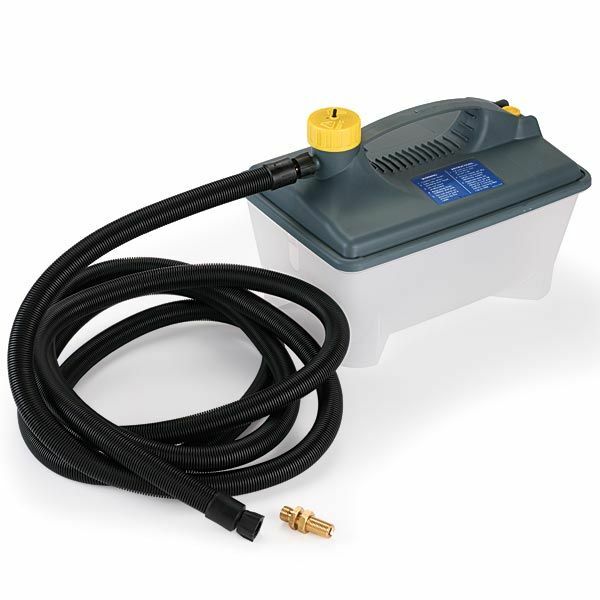 Another Option – Earlex Steam Generator, but it will add about $70 to the cost of your steam system. I steamed two pieces of white oak 1/2″x 1″x 8′ about an hour and they bent around the bow of that skiff not quite like limp spaghetti but close to it. Amazing!